In this post we shall explain our much anticipated use of pre-submission peer-review. This is not the only model of peer-review we will operate. Next week we will explain our post-publication peer-review. You may be asking yourself – how can peer-review happen before submission? This is a good question. Almost all traditional journals only arrange for peer-review to happen after submission. Manuscript review, immediately prior to submission can take place at RIO because of our unique authoring platform: ARPHA. We think this will fit-in well with the normal research practices of many, as researchers often send off manuscripts to colleagues immediately prior to submission for checking with ‘a fresh pair of eyes’ anyway. All RIO seeks to do is to make this natural process more formal and transparent. Indeed, why spend so much precious time on pre-publication review and revisions, when this work could be done in an user-friendly online collaboration environment still during the authoring process? When they think it is ready, they ask one or more colleagues to read the work and give a basic assessment of whether it is fit-to-publish in it’s current form. ARPHA provides Google Docs-like functionality for making inline comments and highlighting as well as ‘general’ comments. This colleague (the pre-submission reviewer), logs into ARPHA from their own account, reads the work on ARPHA, and fills out a simple form declaring the work worthy of being made public to the world in RIO. Final review statement and the name of the colleague is made public alongside the work after publication. RIO will not publish outputs that it thinks are pseudoscience, that have unresolved ethical issues, or are otherwise not appropriate for an academic journal. This applies even if a pre-submission reviewer thinks that the output is ‘OK’ for publication. 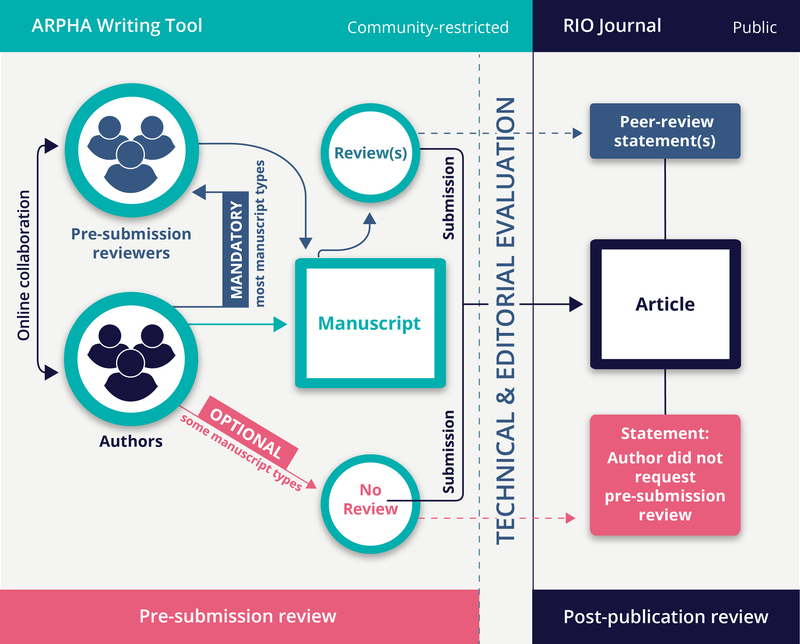 Checks by RIO technical and subject editors are performed both before and after submission to the journal, if serious problems are found, publication may be prevented. For clarity, we have produced a diagram of the proposed pre-submission workflow below. Research Articles, Review Articles, Replication Studies, Methods, Case Studies, Opinion Articles, Data Papers, Questionnaires, and Software Descriptions. Research Ideas, Research Proposals, PhD Project Plans, PhD Theses, Small Grant Proposals, Grant Proposals, Data Management Plans, Software Management Plans, Single-figure publications, Research Posters, Research Presentations, Conference Abstracts, Correspondence, Project Reports, Policy/Communication Briefs, and Wikipedia Articles. Next week, we will blog about our processes for post-publication peer-review. If you have any questions in the meantime, please don’t hesitate to contact us via the comments section, Twitter @RIOJournal, or via email. *Even though pre-submission review is optional for a few manuscript types, the authors will be strongly encouraged to seek peer-review.